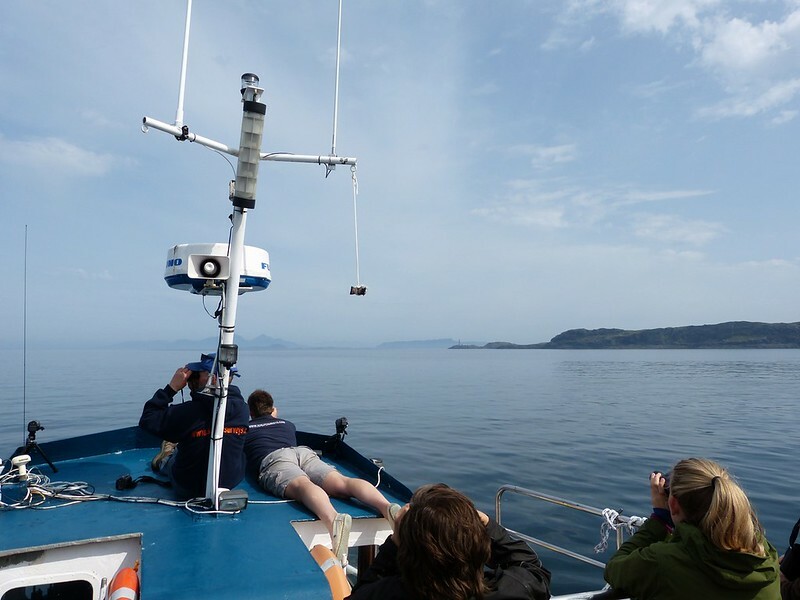 For the last few years I've been eyeing up Sea Life Surveys Whalewatch Explorer trip, a seven hour cruise that heads along the Sound of Mull and out to Coll in the hope of seeing cetaceans. This is by no means a cheap excursion and for that reason I've always held back for fear of seeing absolutely nothing. Even on Mull the wildlife is never guaranteed, a risk factor that only increases when you throw into the mix an entire ocean. 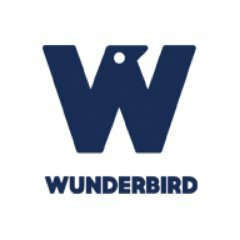 With one eye towards a future on Mull however it seemed the right time to throw a few notes in the direction of this very worthwhile organisation and chance our fortunes on the waves. What followed was one of those life defining days that will live long in both heart and mind. The trip got off to a fantastic start even before we'd boarded when an Otter turned up right next to the pontoon on which we were about to walk. 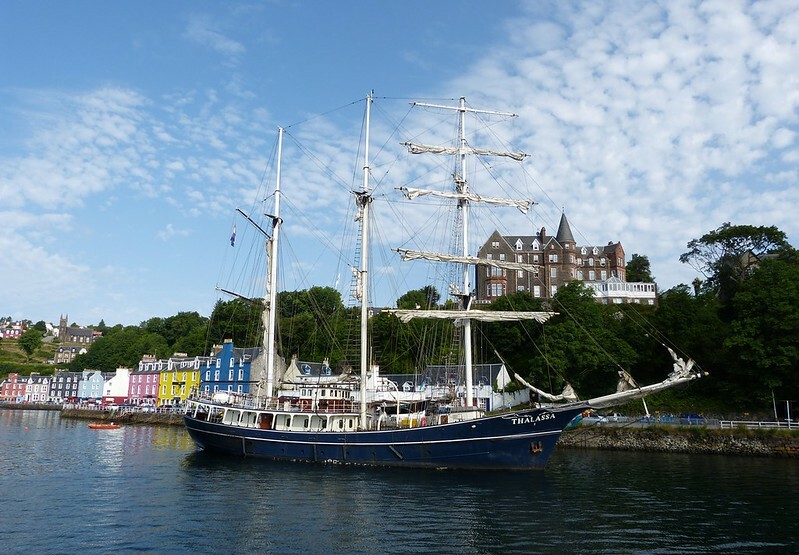 It happily splashed around for a few minutes and as far as I know was still there as we untied and began to motor out of Tobermory harbour. Settling down into our seats we received a very informative talk by one of four experts on board covering which birds and mammals we were hoping to see, and what the main signs for each were. 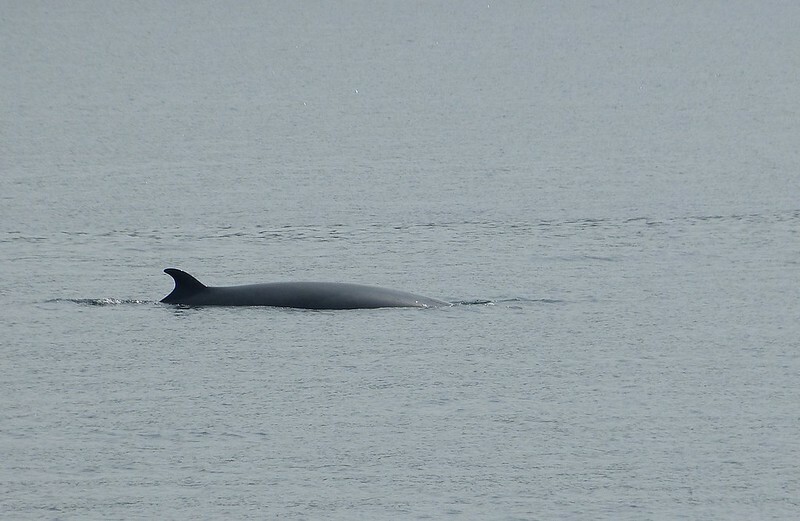 The main target was to be Minke Whales, a species which I'll admit I knew very little about. 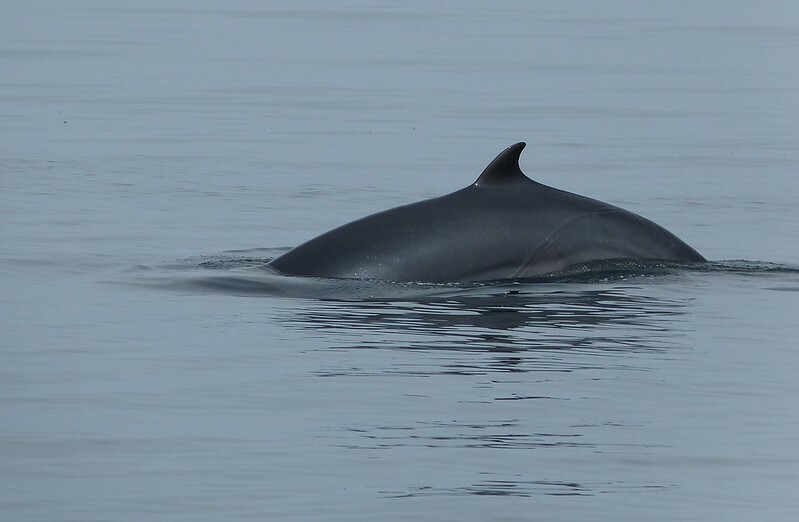 Due to their name I'd got it into my head that Minke's were a relatively small species, a misconception which was corrected within less than an hour. 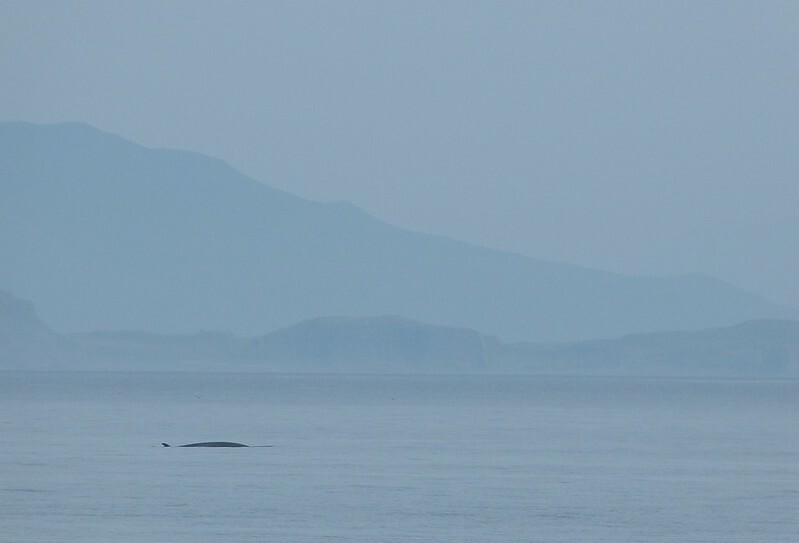 Still in the Sound of Mull a Minke broke the surface at some distance to our right with a gracefulness that both surprised and enthralled me. It surfaced another three or four times before what we quickly began to recognise as a deep dive took it beneath the surface for over ten minutes. Just as we were about to give up hope it reappeared even further away indicating that this was an animal feeding and travelling at speed. Apparently this is behaviour that has been noted more often this season than in years gone by and is perhaps an indication that food is scarce after the long, cold spring. 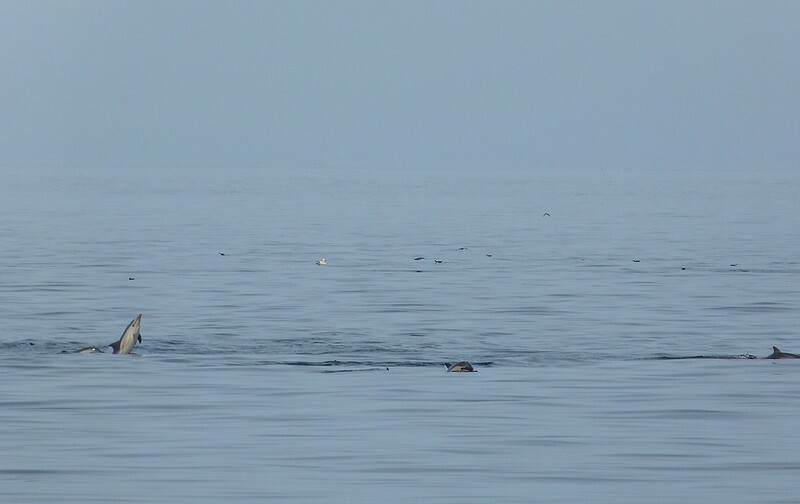 One thing you can probably tell from these photos is just how calm the sea was and considering the range they were taken at, the excellent visibility we were also treated to. Given that the previous and subsequent days were marred by thick fog I think you can safely say that we really hit the jackpot. 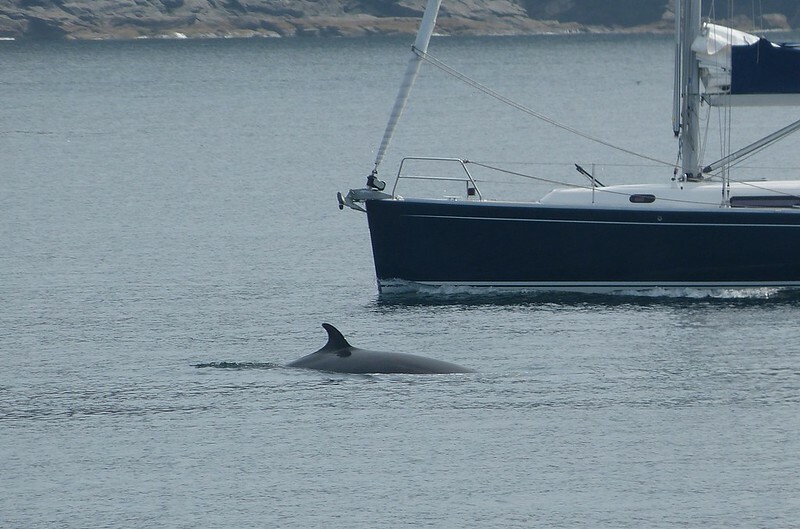 Those superb conditions undoubtedly helped the spotters and by the end of the trip a further four or five Minke Whales were seen including local celebrity "Wrinkle". In my wildest dreams I could not have hoped for a better hit rate. 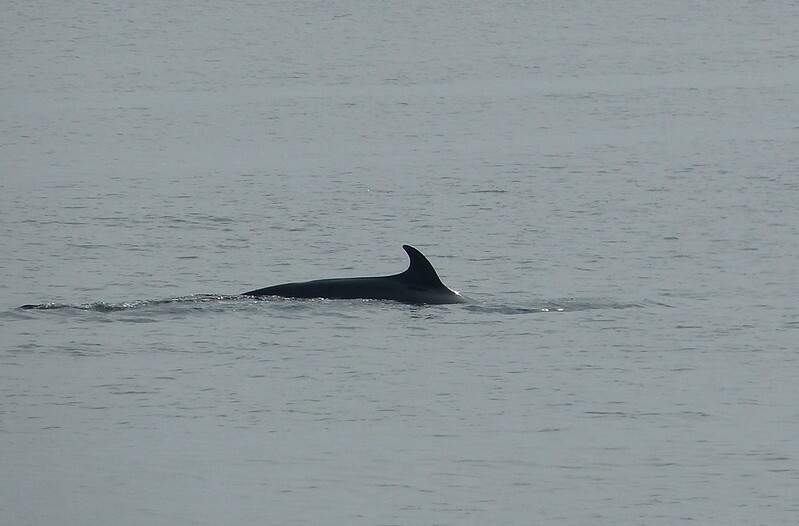 From all the encounters there is one particular moment shared with the Minke's that stands out above the rest. We'd managed to find ourselves in close proximity to a whale that had recently taken a deep dive. As the minutes ticked by the captain shut off the engines and an eerie quiet descended on the thirty two of us aboard. With nothing but the gentle lapping of water against the hull and an occasional call from one of hundreds of gathered sea birds you could feel people tensing all around. All of a sudden that peace was shattered by the sound of a Minke breaking the surface and expelling its lungs. Even now I'm getting goosebumps just writing this so you can imagine how I felt at the time. The sound was so deep that you could literally feel it with your entire being, something that I'm unlikely to experience again. Reading those words it's probably hard to imagine anything topping that, but better was to come as we neared the Cairns of Coll. 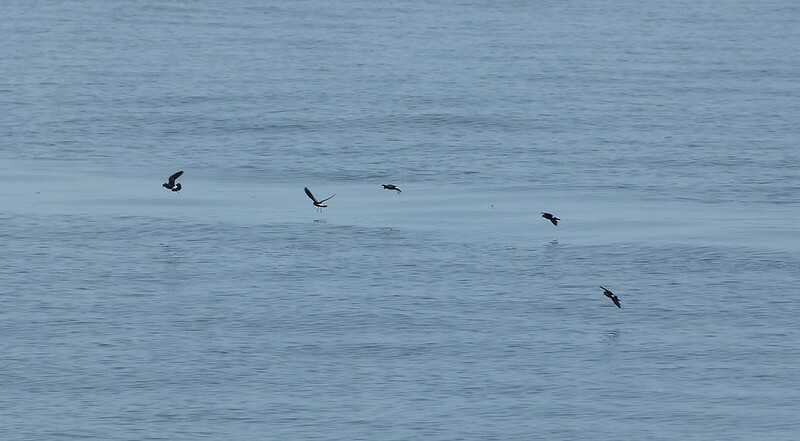 Even from a distance we could pick out a gathering of thousands upon thousands of Manx Shearwaters and as we got closer the splashes from numerous Dolphins also became discernible. 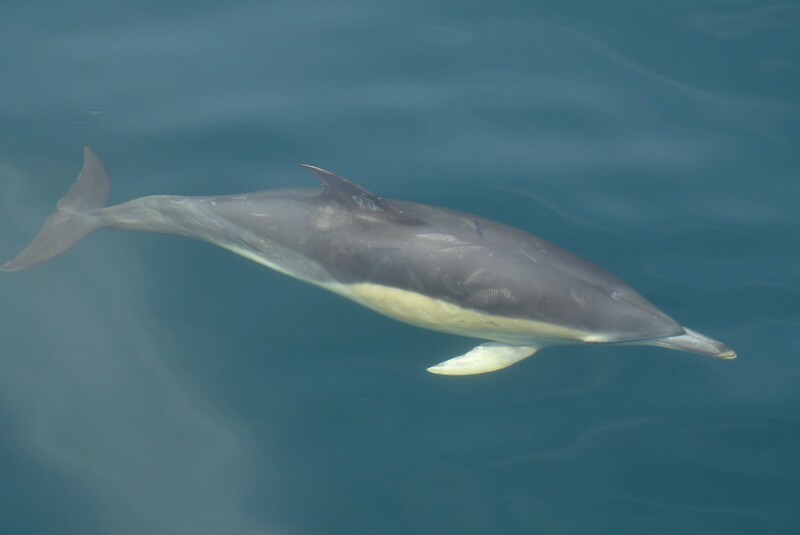 A few minutes later and we were watching the remarkable sight of at least sixty Common Dolphins feeding and playing right across our field of view. 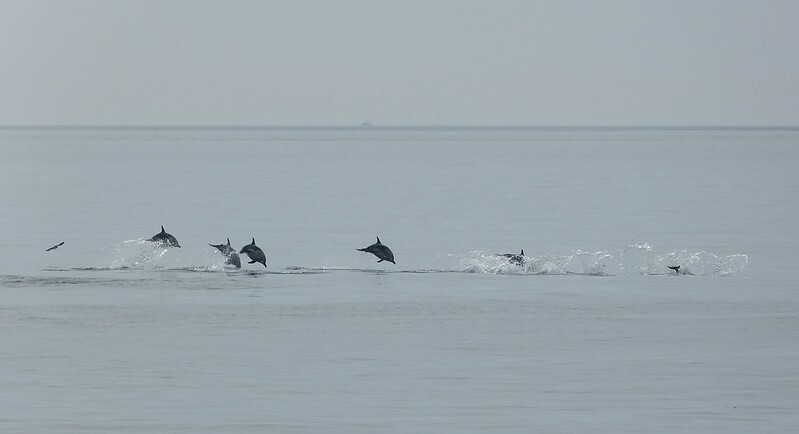 They were breaching repeatedly and often dove clear of the water in perfectly straight and synchronised lines consisting of at least ten individuals. Absolutely mind blowing. Things got even better when a group of about forty spotted our boat approaching and decided to head directly towards us at phenomenal speed. In seconds we were surrounded with more leaping and bow riding animals than I ever dreamed possible, many visible both above and under the water such was its clarity. At times I just had to put the camera down and absorb the spectacle before me so apologies for not having as much of it to share as I would have liked. 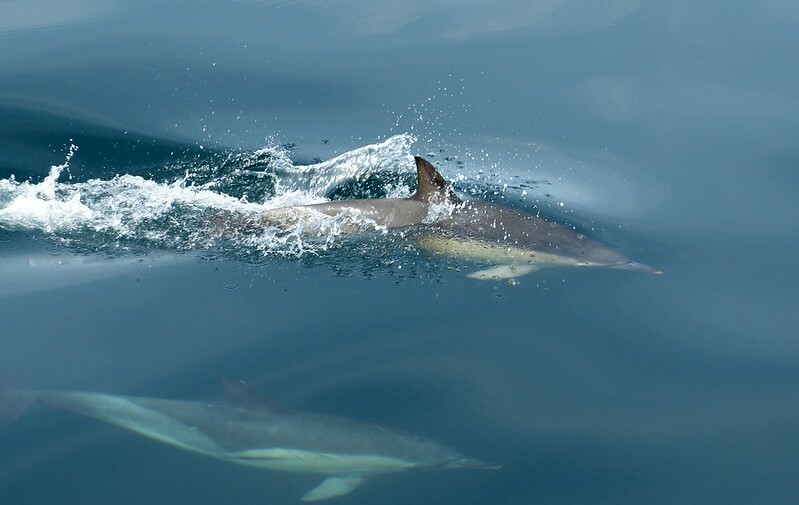 This encounter lasted for at least twenty minutes before our course took us far enough away from their original feeding location for the Dolphins to leave. Even now I can scarcely believe it happened and consider those few minutes some of the best that I've ever lived. You'd think just that would have been enough to make the trip worthwhile, and indeed it was, yet there was so much more to see. Large numbers of Grey and Common Seal also call the Cairns of Coll home before I even start on the birds. I've already mentioned the thousands of Manx Shearwaters that were either gliding past our boat or loafing about on the water, but there were also plenty of Guillemots, Puffins, Razorbills, Black Guillemots, Gannets, Kittiwakes, Common and Arctic Terns and Eider. Both Great and Arctic Skua were also seen exceptionally well not to mention a pair of White Tailed Sea Eagles with their newly fledged youngster. 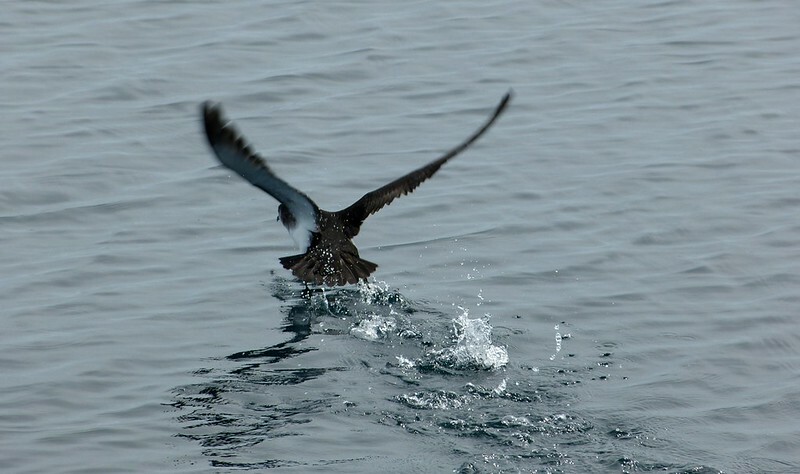 Best of all though was a single flock of fifteen Storm Petrels, a sight so unusual that it even got out experienced crew excited. Personally I've only ever seen two of these tiny birds previously, both at distance and in atrocious conditions, so to have these right in front of the boat was another classic Mull surprise. 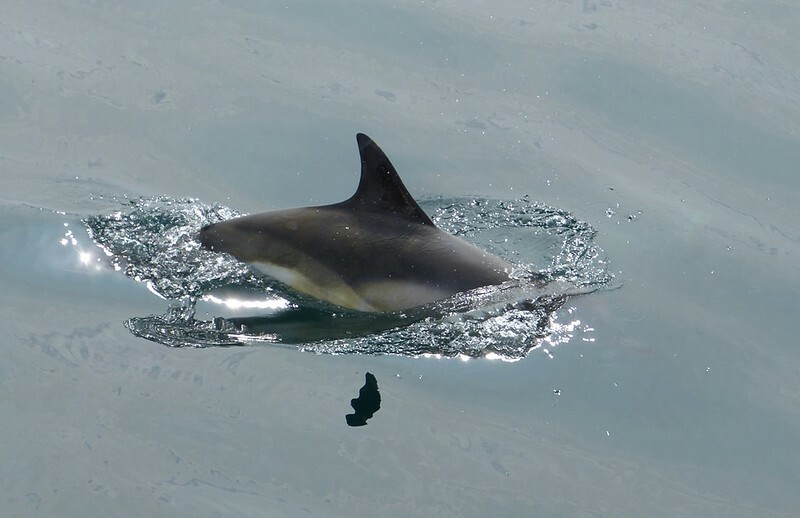 Even while heading back to base we continued to gather more sightings including a playful group of Harbour Porpoise and the only Bridled Guillemot of the trip. 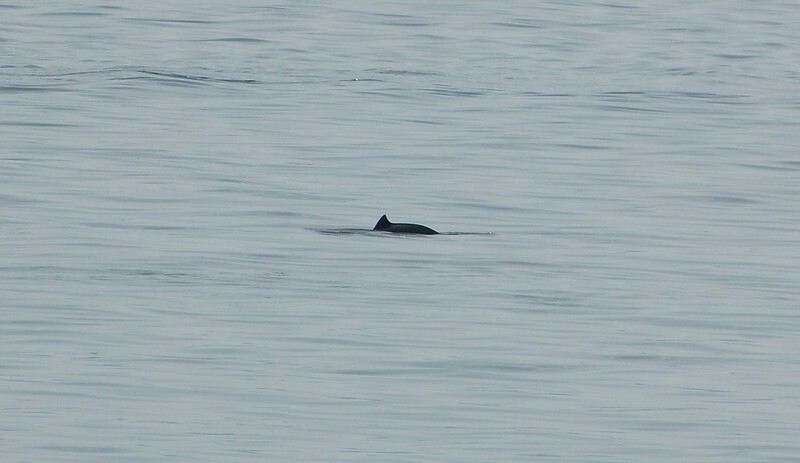 Speaking of Porpoises I've barely even mentioned them here yet they were a constant presence throughout the day. Exact numbers are hard to come by but somewhere in the region of twenty animals is probably a reasonable estimate. Sadly they are a pain to try and catch on camera being so quick and this is the best that I got. When we did eventually pull back into port over eight hours had passed and I was shattered. The ten percent discount voucher presented to us at the end was a nice gesture but almost redundant in my eyes. Of course I'll be back next year. After all, there's still the possibility of Orcas. what an amazing trip! You saw some awesome sea critters!!! Utterly incredible! 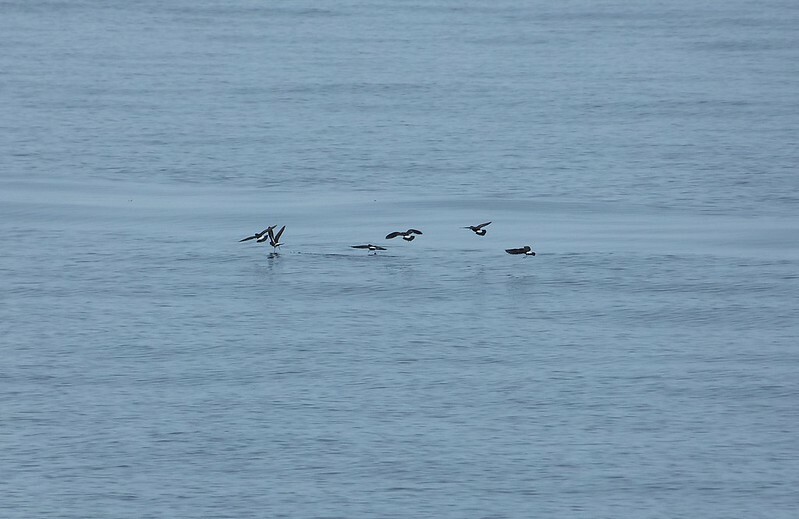 And such a range of avian, cetacean and seal life ... Those calm conditions look ideal. We failed to see any Tysties this year in Scotland ... and I've never seen a Brindled Guillemot. P.S. That should read 'Bridled'!